Cat Urn- Precious Kitty, Gold. 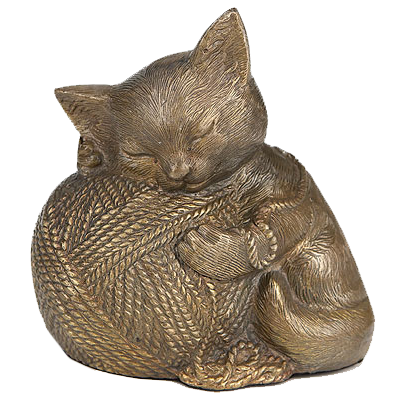 Our Precious Kitty Cat Urn is designed specifically for your beloved feline friend. These high quality artistic cat urns are made from solid aluminum and are available in bronze, silver, gold and copper antique. Your pet's ashes can be placed in these beautiful cremation urns through a bottom opening secured tightly with a round tamper resistant plastic closure. Available with or without walnut base with engraved plate.